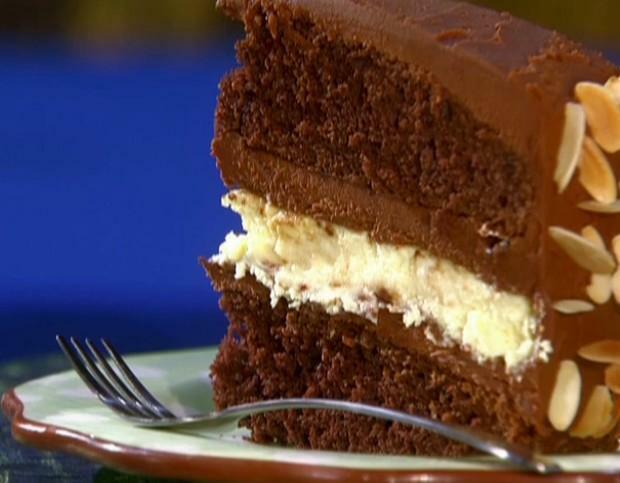 Like the familiar hum of a loved one’s car gently pulling-up in the driveway, the accustomed ebb and flow of good friend’s voice, or the rhythmic exhalations of the beloved family pet; you’ve heard it all before. We’ve long said that there’s no Return on Investment (ROI) for Business Intelligence (BI) unless you make a decision – or at least a good decision based on accurate data and information interpretation. It sounds so blindingly obvious, but providing an adequate and decisive pathway from information to action is frequently overlooked in the reporting and analytics realm. Communicating the right information, to the right people, in the right manner is critical to underpin BI success. Worldwide enterprise IT analyst and advisory firm, Gartner, estimates that somewhere between 70 and 80 percent of BI projects ultimately end in failure. And the number one reason cited for this disturbing rate of debacle? Poor communication. “BI is not a crystal ball that pops out the answer,” says President and Research Director at Gartner, Patrick Meehan. “People in IT need to stop approaching BI as a vendor or engineering solution, or as a tool. They need to understand what business they are in. They are in the information and communication business." TDWI (The Data Warehousing Institute) estimates that the inability to communicate accurate information effectively costs US businesses alone over $600 billion a year. Dashboards are one of – if not the – fundamental mechanisms for delivering the information produced by a BI system to decision-makers. In fact, dashboards are the number one strategic BI technology, according the 2012 Wisdom of Crowds Business Intelligence Market Study by Dresner Advisory Services. 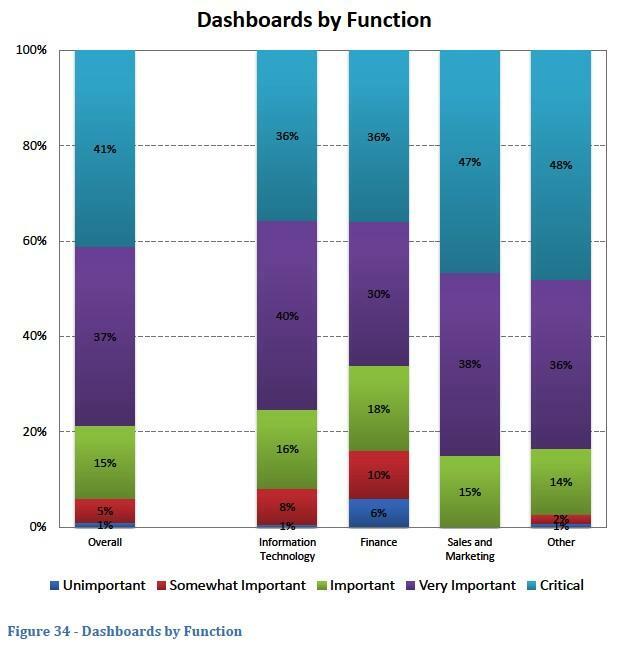 Ninety-four percent of respondents to the 2012 study said that dashboards were integral to the success of their BI projects, with 42 percent listing them as “critical”, 36 percent as “very important”, and 16 percent as “important”. 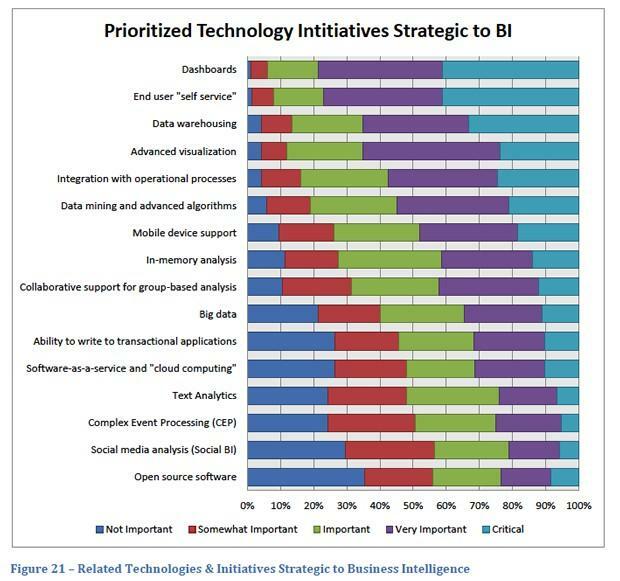 The study also revealed that, when analyzing the perceived significance of BI dashboards by job function, those working outside the IT department and more traditional recipients of BI (the finance department) placed the highest degree of importance on dashboards for delivering BI information. Not only does this indicate that dashboards are crucial for driving pervasive BI deployments that venture outside IT’s inner sanctum, it also alludes to the essentiality of clearly and effectively communicating the meaning behind the numbers displayed – dashboards must enable non-technical business users of a non-analytical mind to easily and accurately interpret the data exhibited. Although, it seems that many organizations lose sight of this one simple objective all-too-often. But isn’t data quality to blame? Many assume that if the data being represented by a front-end BI tool is accurate, so to will be the resulting interpretation of the information presented. And, of course, that school of thought is both prominent and correct. 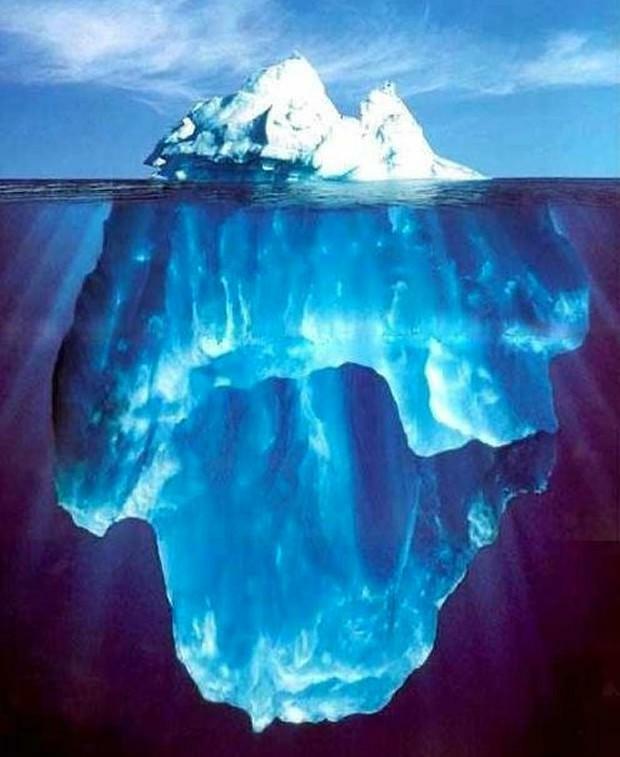 In other words, the tip of the iceberg (dashboards) is only as good as, and reflects, the quality of its foundations (the data). So while it’s true that results gleaned from BI initiatives will only ever be as good as the underlying data set, the ability for miscommunication to derail accurate analysis, and eclipse even the tidiest of data sets, is a major source of BI confusion, cynicism and abandonment. Few frequently laments the persistent state of most modern BI dashboards, arguing that they fail to achieve their one true goal – to communicate information. “Dashboards are not for show. They’re for communication,” says Few. “No amount of cuteness and technical wizardry can substitute for clear communication. “You can spend millions of dollars to build the most robust and pristine data warehouse in the world, running on the most powerful hardware, and accessed by state-of-the-art Business Intelligence software, but if the people who work with the data don’t know how to make sense of it or how to present it clearly to decision makers, your investment is wasted. Mark Smith, CEO and Chief Research Officer at advisory firm Ventana Research, echoes Few’s sentiments. And as long-time industry analyst, Jill Dyché, put it – BI technology requires both a clear message(s) and a messenger to augment success. Few’s grievances also point to a potentially growing problem. Despite the development and emergence of more, and more complex, data visualization technologies, many organizations seem to be transfixed on harnessing these new capabilities to display data in the most dazzlingly – rather than the most intuitive – way possible. An alarming thought, considering that Gartner’s 2012 CIO survey showed that analytics and BI is the number one technology priority for CIOs in 2012. Overall, this problematic trend seems set to multiply in the foreseeable future. An opinion with which Few agrees. “Dashboards are extremely popular today,” says Few. “Everyone assumes that dashboards are useful. Like all aspects of Business Intelligence, however, they can be done well or they can be done poorly. “Most dashboards fail. In their attempt to dazzle us visually, they fail entirely to present information is a way that can be understood at a glance. Is there any hope for BI and dashboards? Ventana Research’s Smith takes this denigration of the modern BI dashboard one step further, essentially suggesting that they are a botched technology. “The early forms of dashboards appeared in the 1980s, but in my honest evaluation, today’s dashboards have not gotten much more intelligent in all those years,” wrote Smith in a recent blog post entitled The State of Dashboards in 2012: Pathetic. Smith even aligns the failure of the modern BI dashboard with the infamously low rates of BI user adoption – commonly estimated to wallow between eight and 24 percent (TDWI). “The lack of adoption of Business Intelligence that includes dashboards is notorious in this industry,” continues Smith. “If we want to learn from the disappointing decades of Business Intelligence deployments, then we should find out what our business users really need to take action and make decisions on the information; delivering prettier charts won’t help. This fatalistic assessment of the BI landscape and associated dashboard deployments might leave you feeling bewildered, and thinking that the situation is hopeless. So what’s the key to BI dashboard success? How can you pull your current or future dashboard plan out of the apparent, and rapidly approaching, proverbial fire? By following a clear set of inflexible design and delivery guidelines based on optimal communication and design best practices – that’s how. Join our upcoming Webinar to discover how to develop best practice dashboards that empower your relevant decision-makers to successfully attain business insight – via accurate, relevant, actionable and timely information – and take better, faster fact-based action.